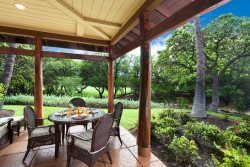 Waikoloa Beach Villa makes hosting family gatherings or beachfront get-togethers a pleasure. This exquisitely villa boasts 1,753 square feet and features three bedrooms, and comfortably accommodates up to eight guests. Included in your stay is the Hilton Pool Pass for up to 6 guests for all stays thru December 31, 2019. The main living area boasts an open floor plan, making the home perfect for entertaining or relaxing with family and friends. The living room is warm and inviting, and the kitchen is fully-appointed. Off the dining area is one of two outside lanai’s that holds a gas grill, a dining table with seats for six, and artistic patio furniture. Views from the living area are spectacular and unobstructed, as they are from nearly every room in the villa. On the plaza level, there is guest bedroom with a queen-size bed and a full bathroom next door. The upper level to more bedrooms; the master suite features a king-size bed and an attached bathroom. The other guest bedroom offers a queen-size bed with an attached bathroom. Also located on the upper level is a loft with a sofa sleeper and a washer and dryer. All bedrooms have a flat screen TV. This unit also includes; basic cookware, dishware, drinkware, coffee maker, blender, washer/dryer, hairdryer, bed and bath linens, iron, air-conditioning, wireless service, basic cable TV. There is plenty of beach gear like chairs, boogie boards, cooler and umbrella as well as beach towels for your use. The Waikoloa Beach Villas is a low-density community of 120 units on approximately 20 acres. Beautiful, manicured grounds have two swimming pools, two hot tubs, one fitness room for your relaxation and enjoyment. One of the best located complexes in Waikoloa Beach Resort is the Waikoloa Beach Villas. Ideally located within easy walking distances to the Queens’ MarketPlace, Kings’ Shops, A Bay Beach, Hilton Waikoloa and the Marriott hotels. They came to refill our gas tanks for the grill the very next day after we requested it. It wouldve been nice if it was filled already when we first checked in though (we had already prepared food to be grilled until we checked the tanks and they were both empty). Loved being centrally located to the shops, beaches and hotels. It was even more enjoyable that we had access to the Hilton pools! It was a beautiful, well maintained 3-bedroom 3-bath condo that exceeded our needs and expectations! This was our 2nd time staying on this property and wont be our last! Very friendly staff, good response rate, great and timely follow-up with our questions/comments, nice concierge service available to answer questions on activities too. We will be back and, in fact discussed about inquiring about purchasing a vacation place there. As always Resortica's staff is very professional and immediately addressed our needs.